On March 23, 2018 the entire St. Rita community came together to witness the official naming of the Bernard J. DelGiorno campus. In recognition of his most generous gift of $2.5 million, the campus, St. Rita’s home at 77th Street and Western Avenue since 1990, will now be known as the Bernard J. DelGiorno Campus. Mr. DelGiorno, first vice president of Investments at UBS Financial, said his immigrant parents settled on the south side 97 years ago, where he has spent his entire life. Mr. DelGiorno attended Calumet High School and then went on to earn three degrees from the University of Chicago in Hyde Park where he still resides. “As a lifelong resident of the south side of Chicago, my intention was to help invest in the outstanding St. Rita High School legacy, students and facilities. 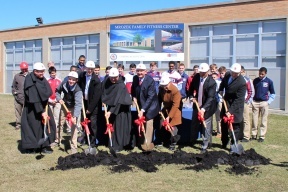 This commitment to the St. Rita capital campaign is an indication of my confidence in the quality of the staff, alumni, and superior educational process provided to the students of St. Rita,” Mr. DelGiorno stated. The campus naming in conjunction with St. Rita’s $5.25 million Champions Will Be Made capital campaign ushers St. Rita into a new era of construction and campus renovations. Located on the south side of Chicago, St. Rita of Cascia High School is 113 years old, founded in 1905. St. Rita is a Catholic, Augustinian College Preparatory School. Originally located at 63rd & Claremont Ave, St. Rita moved to 7740 S. Western Avenue in 1990.